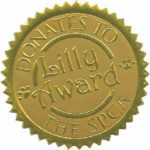 Tiny Receives The Lilly Award! 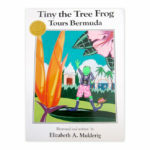 The first book written about Tiny the tree frog was ‘Tiny the Tree Frog Tours Bermuda’. It is Bermuda’s best selling children’s book even today having sold thousands of copies. It is now in it’s eighth edition. The book has been made all the more classic by receiving the Lilly Award from the Bermudian magazine for best design. David Conrad, the designer of this book lives in Boston and met the author/illustrator Elizabeth Mulderig while attending art school. David was considered the ‘star’ of the Butera school of Art and Elizabeth was considered the ‘black sheep’. This turned out to be a winning combination when the star and the black sheep worked together to produce Elizabeth’s first and award winning book.